Bergamo is Milan’s cute, quiet, underrated little sis. 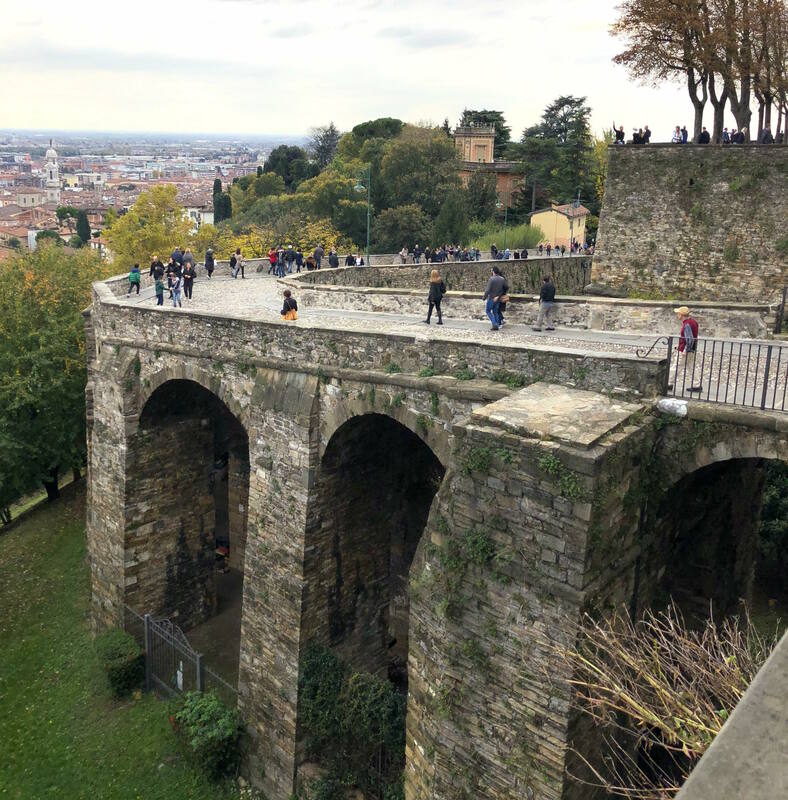 People may recognize it simply because the Bergamo airport serves Milan, but this small city has much more to offer than just a transport hub. 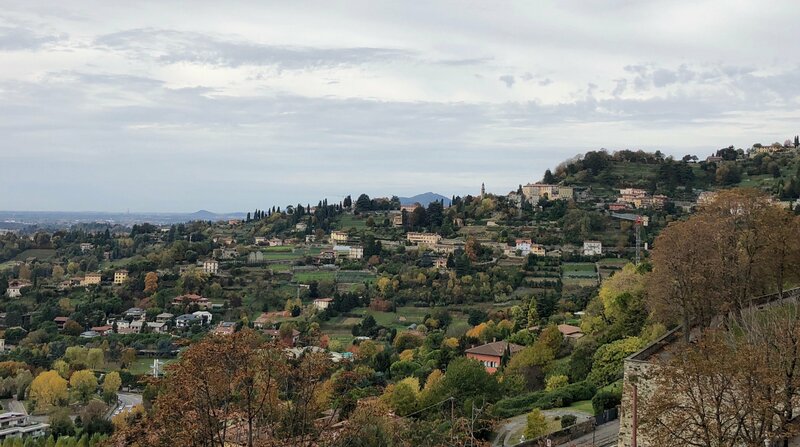 A day trip to Bergamo is totally worth it if you want a relaxing, authentic, small-town Italian experience. Bergamo is divided into two parts: Città Alta – the upper city – and Città Bassa – the lower city. Città Alta has quaint medieval charm; Città Bassa is newer and more modern, but it’s a convenient place to stay due to its proximity to the train station, which provides access to the airport as well as to trains around Italy. 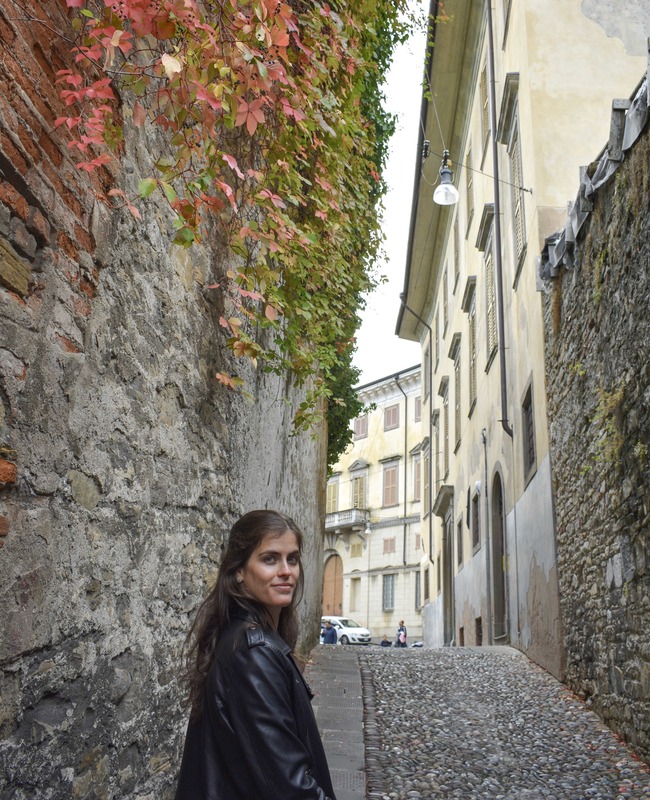 Here is my guide for how to allot your time between these two parts of town on your day trip to Bergamo! I recommend spending most of your day trip to Bergamo in the atmospheric Città Alta. 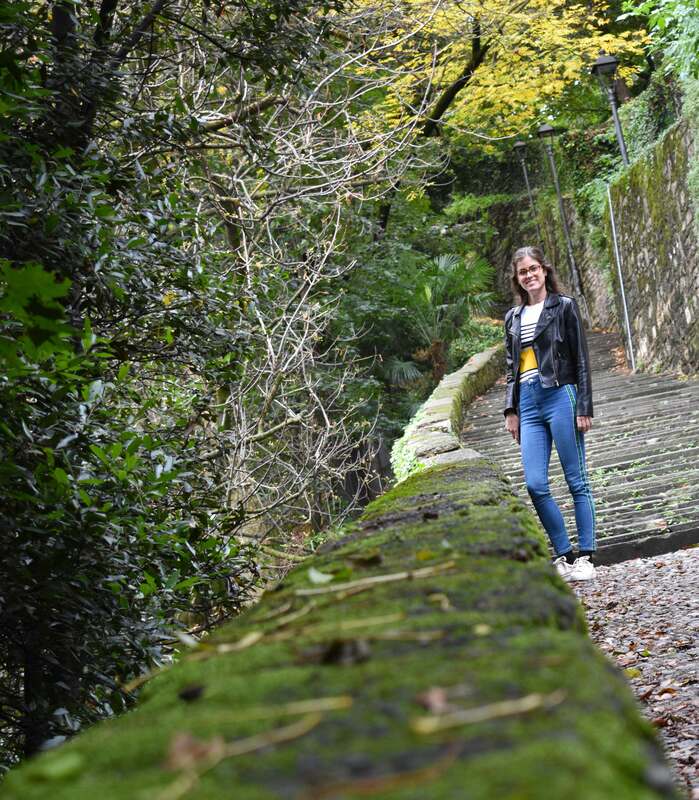 Start your day by ascending up to Bergamo Alta on the moss-laced walkway after sipping an espresso or macchiato Italian style – standing up. After being welcomed by Porta San Giacomo as you arrive into town, head towards the central square, Piazza Vecchia. Here you’ll find some of the city’s most important structures, like the bell tower and the Palazzo della Ragione, a 12th-century palace bearing the lion of St. Mark, a symbol of Venice’s historical reign in the region (Think: Venice’s famed St. Mark’s Basilica). The highlight of this part of the city is undoubtedly the Basilica di Santa Maria Maggiore. 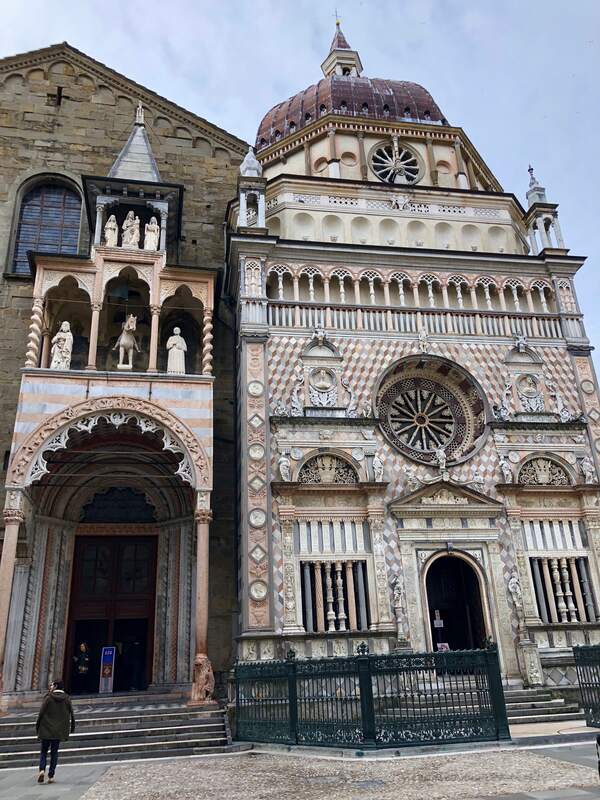 Although Maria Maggiore is not technically the cathedral of Bergamo – the white Cattedrale di Bergamo is actually right next to it and worth a visit as well – this dreamy basilica will steal the spotlight of your day trip to Bergamo. Without exaggeration, this is one of the most beautiful churches I have ever seen. 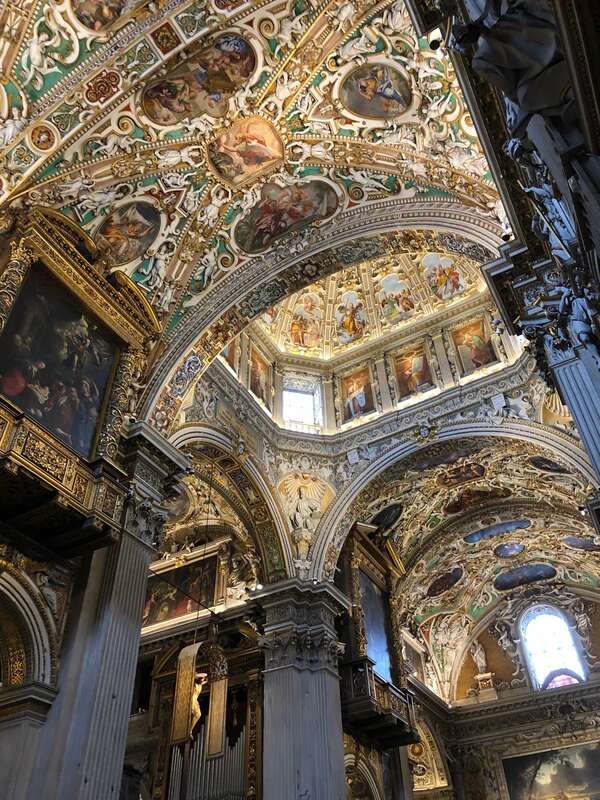 Milan’s Duomo may have the claim to fame in this region of Italy, but the ornate interior of Maria Maggiore (see below) is much more impressive than the interior of its counterpart in Milan. Don’t get me wrong – Milan’s Duomo is drop-dead gorgeous. However, its interior is a bit austere and unlike its more stunning exterior façade. Maria Maggiore has it all: a breathtaking interior along with an intricate outer façade characterized by white, black, and pink stone. Winning combo in my book! When inside the cathedral, look out for a pamphlet that has a guide to the many works of art in the basilica. It may cost a euro or two, but it is definitely worth it and will allow you to more deeply appreciate the frescoes, sculptures, tapestries, and other works of art in the church. The choir was practicing on the morning we visited, and, needless to say, they sounded like angels – check out the video below. The visit to the basilica was just altogether awe-inspiring. Basilica di Santa Maria Maggiore – note the richly decorated facade! 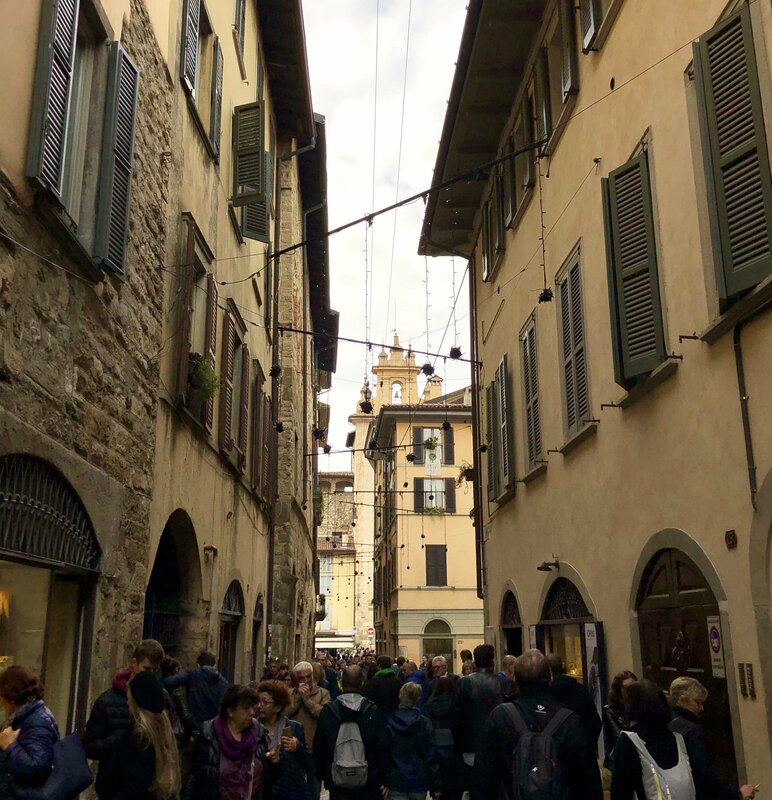 When in Bergamo, you gotta do as the locals do…and stroll! 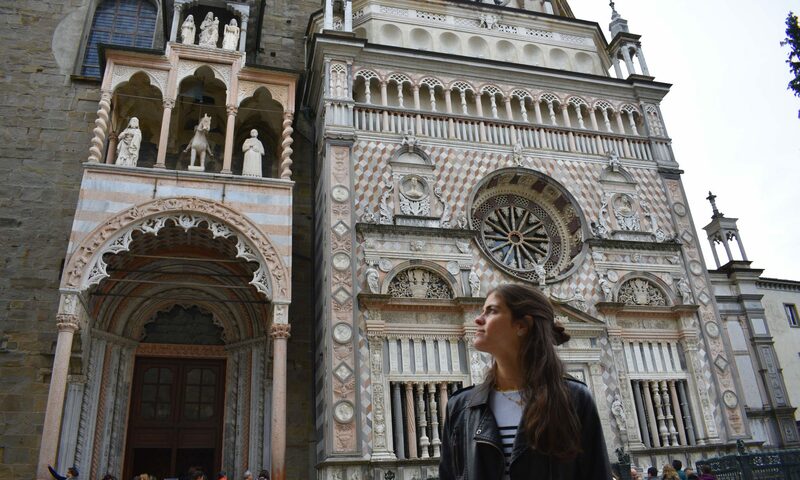 Italians are known for their passeggiata, and we saw some serious strolling in Bergamo. Locals – dressed to the nines, of course – were out walking their dogs, shopping, and chatting with neighbors on the Sunday morning in early November when we visited. The perfect complement to this Sunday passeggiata was the music floating from virtually all corners. I’ve never seen more street musicians in my life: we heard the harmonica, accordion, guitar, violin, and even the harp, just in one morning! 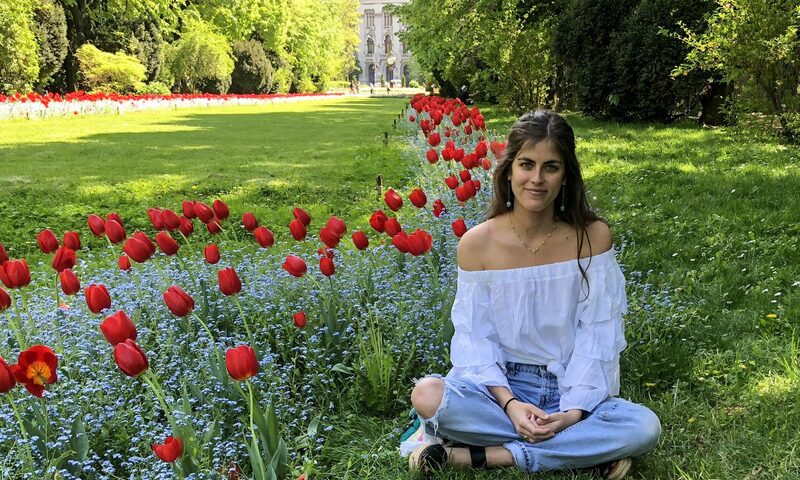 This sweet music – including the melody of the well-known Bella Ciao in the video below – made for the perfect ambience to soak in the joys of this Italian city. We were also lucky enough to coincide with a small food festival in one of the central plazas. Small stands were serving up local cheeses, wines, and polenta taragna, a typical polenta dish made with buckwheat flower, which gives it a uniquely dark color. Snacking on some wine and cheese amongst locals made for a great pre-lunch aperitivo! 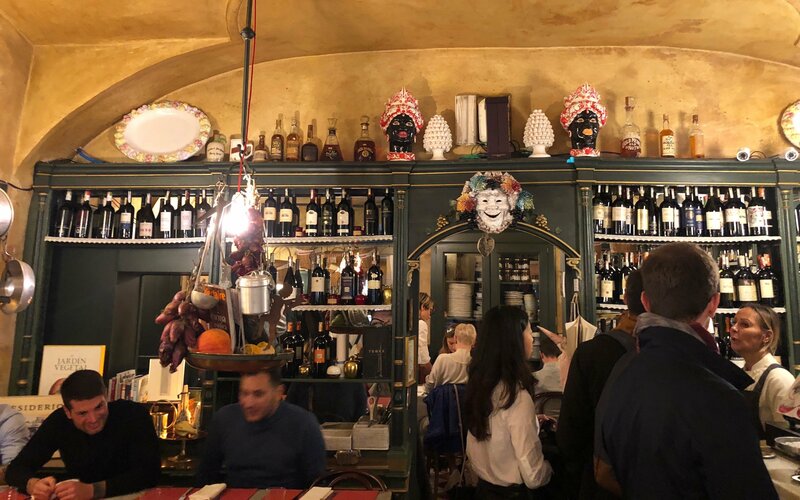 Once you’ve worked up an appetite for lunch, I recommend stopping into the cozy Vineria Cozzi (yes, it has the perfect name to match its snug interior). Pop in at some point in the morning to make a reservation for lunch, as this little eatery can fill up. 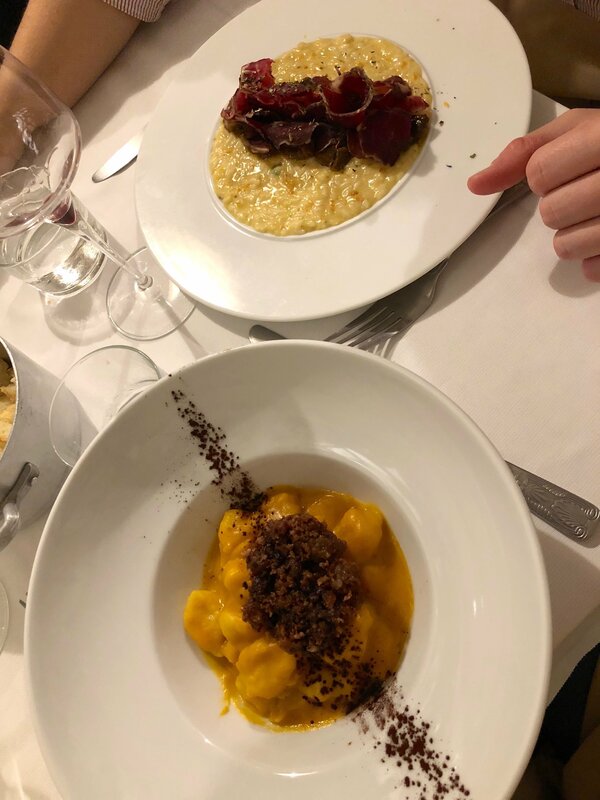 We ordered pumpkin gnocchi with sausage and mushroom risotto with ham – both delicious! After lunch, look out for Polenta e Osei, a typical dessert of Bergamo, in the windows. 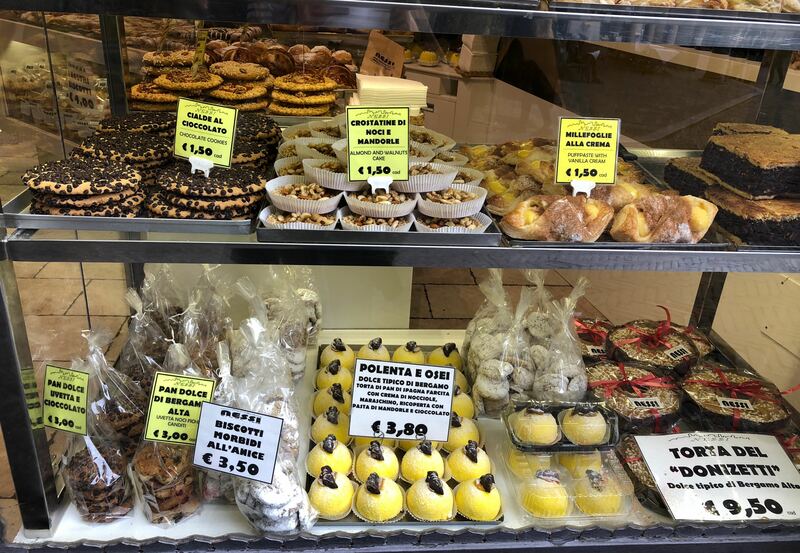 Polenta e Osei is essentially a sweet sponge cake filled with cream and chocolate, covered in a yellow coat of sugary marzipan. 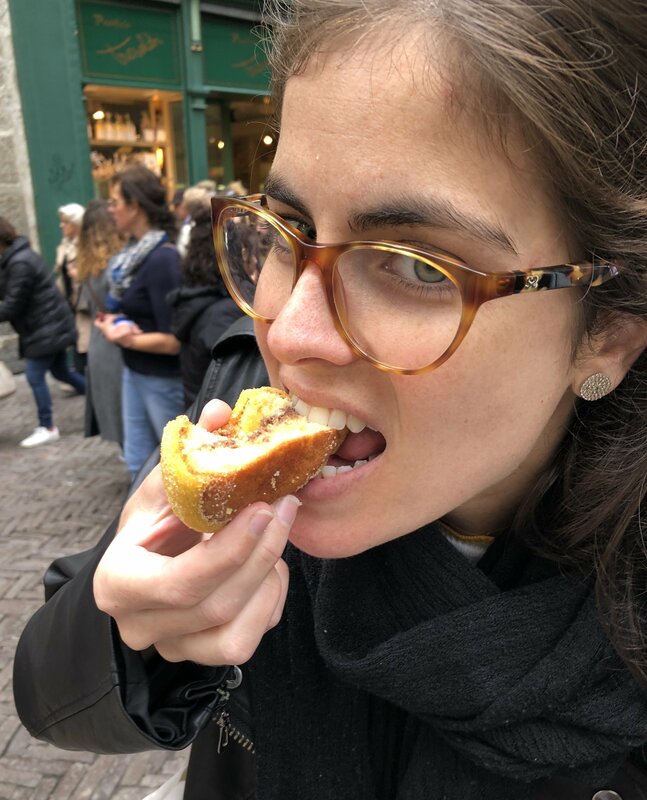 With this sweet treat in hand, spend the afternoon of your day trip to Bergamo getting lost through the winding streets as you stumble upon views of the city below. A *flattering* pic of me munching on some Polenta e Osei. Note how it’s really more like a cake than polenta! A kind older gentlemen, who we met in the Basilica di Santa Maria Maggiore, recommended that we take the funicular up from Città Alta for views over the entire city. Unfortunately, we did not have time to do this, but it could make for a great afternoon activity! 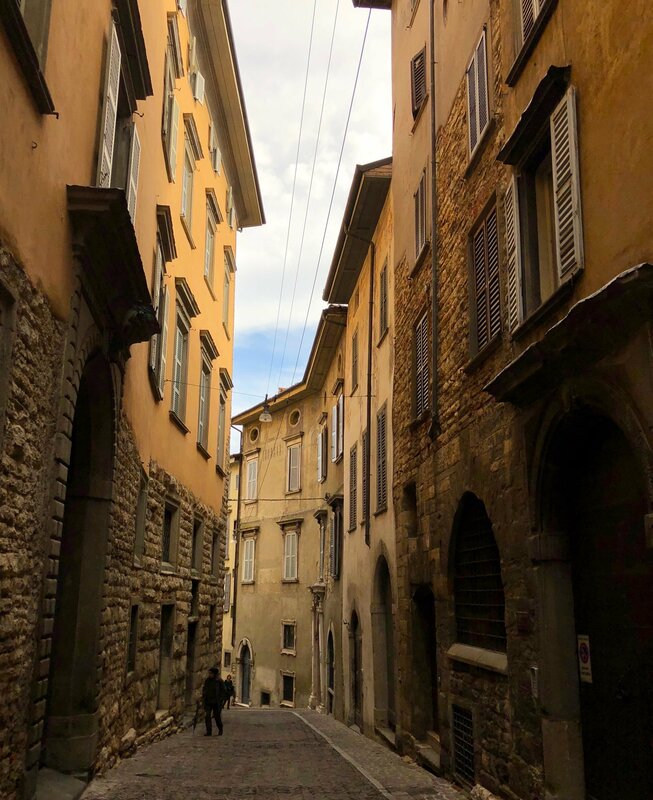 We didn’t do much in Città Bassa during our visit to Bergamo – we just spent the night there because it was close to the train station (making our day trip to Verona easier). However, I do recommend closing out your day trip to Bergamo by eating dinner at L’Osteria di Valenti. This quaint restaurant is popular among locals and serves absolutely delicious food. 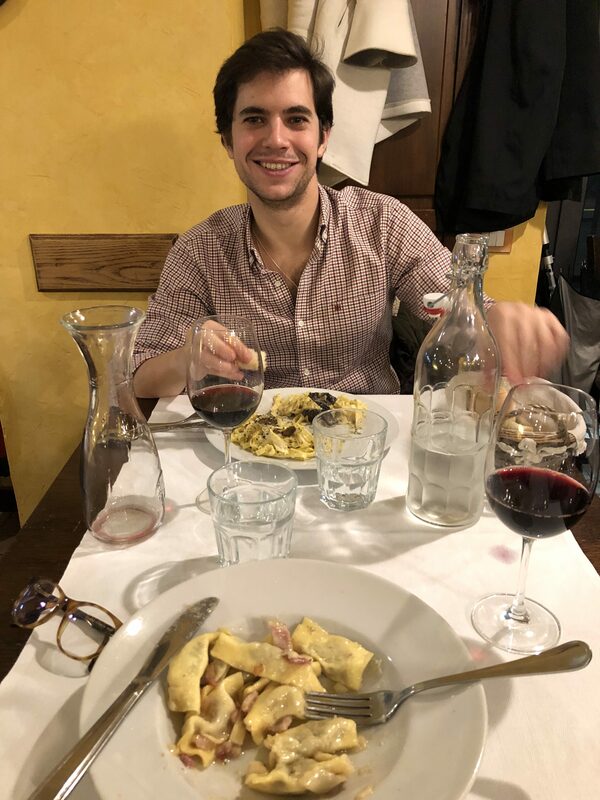 Must-orders include casoncelli (a typical dish of Bergamo that I can best describe as a scrumptious ravioli-ish, pocket-like pasta filled with meat) as well as the truffle pasta with mushrooms. Both dishes were TO DIE FOR. We also ordered some of the red house wine and a cheese plate to start. Needless to say, our stomachs were very pleased with our orders here. A word to the wise: the restaurant usually closes at 11 pm, so plan to eat at around 8 or 9 (i.e. don’t go in there with a Spanish mentality planning to eat at 10:30 at night). Dinner at L’Osteria Di Valenti. I’m eating Casoncelli (essentially meat-filled pasta pockets of love) and Pepe is having truffle fettuccine and mushrooms. YUM! I hope you enjoy your day trip to Bergamo as much as we did!